Robyn Fraser, BSc, ND, M.OMSc, is an experienced Naturopathic Doctor, Osteopathic Manual Therapist and NMT practitioner, practicing in Guelph, Ontario Canada. She completed her undergraduate Bachelor of Science degree in 1994 at the University of Guelph. 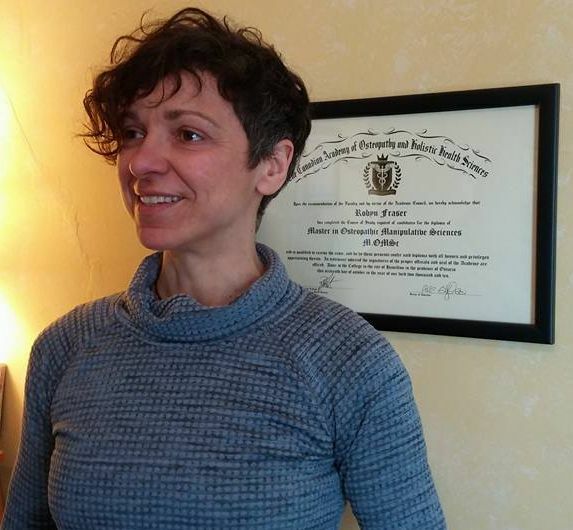 In 1998, she graduated from the Canadian College of Naturopathic Medicine, a four-year, full time program, and at that time the only accredited naturopathic college in all of Canada. She has been practicing as a registered naturopathic doctor since January 1999. In 2006, she entered the Canadian Academy of Osteopathy and Holistic Health Sciences, a four-year program in Hamilton, Ontario. In 2010, she completed her osteopathic thesis and has been awarded a Master in Osteopathic Manipulative Sciences (M.OMSc). She is currently using osteopathic manual therapy as part of her medical practice. Today, Robyn's chief interest is helping people with a variety of health conditions through osteopathic manual therapy as well as teaching patients how eating a healthy, whole-food, plant-based diet can greatly improve their health and eliminate many diseases.